Can you share your service with me and I can take a look? 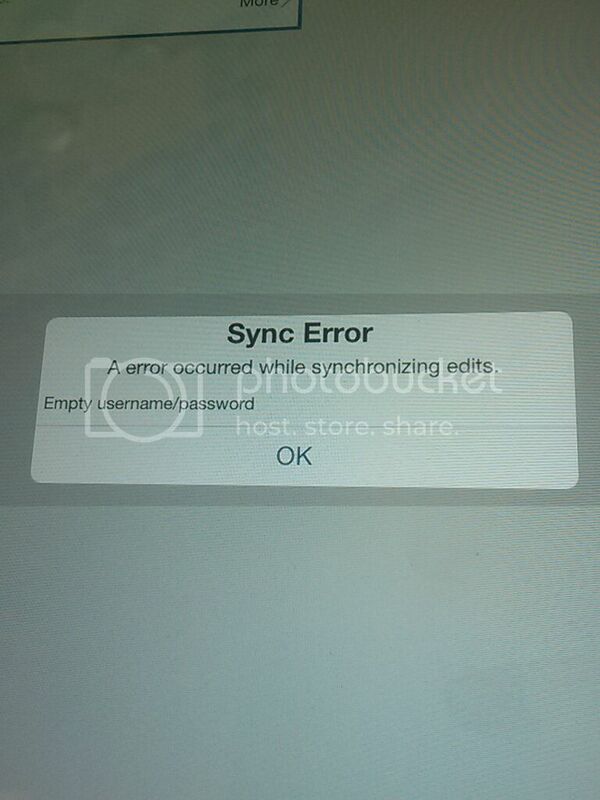 I encountered the same problem when trying to sync data that included a photo attachment. Is this something that ESRI is aware of and planning to fix? I figured out the problem. It is when I take a picture and try to upload it with the sync. Another question, maybe not for this forum, but maybe you could point me in the correct direction. Is it possible to make an editable layer in arcmap online if you do not have ArcGIS desktop? Do you mean you've taken pictures and added them to features as attachments? I have also encountered a sync issue - the error message states "Empty username/password." Has anyone else got this? I'm logged in, obviously as I can get to the map. I�? ?ve force closed the app, reset the ipad, etc. and it still does it. Any thoughts/ideas? Did you ever resolve this issue? I am having the same problem. Make sure you're using the latest version of Collector (10.2.5 currently). We've fixed a number of authentication issues recently. I am actually running 10.2.5. Just can't seem to get past this issue. I get the error message when trying to download an extent worth of data. Perhaps it's an issue with the map service? Are you using Portal for ArcGIS? So the issue is you need to set up a proxy on the esri basemaps you are using so an AGOL credential gets sent across to access the tiled basemaps service. Right now its sending your portal account which will not authenticate with the basemap service. Here is a link to the Collector doc that should help you out with taking maps offline with Portal for ArcGIS. Unable to download the map. This map does not support being downloaded to the device. Are you using feature services with full editing capabilities and tiled map services that support export? Also is any of your data versioned? This will be read only data. I get this error while trying to add the map service...perhaps I should create my own? You will need to use credentials from an AGOL subscription to gain access to tiled basemaps. You could also cook your own tiled service on your service and enable export on that service and when it is accessed in the app through the web map you will be able to create that offline database and tpk from the map or you can sideload a tpk instead and download the database with that sideloaded tpk. Also if you are using a portal that is using https you will need to use a https URL for tiledbasemaps and not http. Are you required to have a pay account to access the tiled basemaps? We have portal 10.2.2 setup and I'm trying to add these tiled services as items to our portal, but I keep getting valid service creditials errors. I'm using a free AGOL account and we use only HTTPS so I have that in the service URL. We already pay for portal, so I would be unexpected that this needs to be a paid organizational account. Yes, to access the tiledbasemaps services you need to have an org account as well. Does this workflow work in the current version of Collector and Portal/Server 10.3. We have setup the environment internally with WA/ADFS/IWA and things seems to be working fine for the Portal overall and for setting offline capabilities with our feature services but following the workflow for the basemaps seems to be problemsome and not currently working. I can use sideloaded without issue. So with the support of an ESRI tech on an opened ticket I was given a workflow to allow fo rthe download of tiled AGOL basemasps. The worklfow is a little different in that it does not store the user/ pw login and the user gets prompted upon opening map for internet or download use. A little inconvenient. Does the 10.2.2 workflow, Take maps offline—Collector for ArcGIS | ArcGIS work in 10.3 Potal? I also have the same issue, and have not been able to resolve it. in collector I get empty username/password error. Has anyone solved it ? Thanks for your reply. But I have already gone through that link and have followed all the steps. I am still getting empty username and password error. Do you have existing basemap can be used to download? We would like to know it is basemap issue or feature service issue. Also, here are other options that can provide more info. In Server side, Could you set server logging level to debug and see if you can spot any errors reported back when you download? Thanks for your reply. I will try this tomorrow and will update about its results. Thanks for your help, and the problem is Partially solved… Looks like it was more issue of the Feature service than the basemap. Portal and ArcGIS server were using different SSL Certificates. I modified them to use same SSL certificate from ArcGIS Server admin page, and the previous error of empty username/password disappeared. This dialog box only shows one OK button, but when I click it and try to download again, the same error appears. I should also point out that my Portal and ArcGIS webserver are yet not exposed to public internet. You should make sure your device is connected to internal network. Do you use iOS or Android device? You can try to install the certificate into your device by copying over or emailing yourself and opening in the device. I have also installed the ssl certificate on iPad as you outlined last time, but in iPad settings, its status is being shown as “not verified”. Can this issue be related to self-signed certificate from IIS manager, because that is the one I am using at this time ? Ah, self-signed certificate can cause an issue in iOS Collector. Are you using self-signed certificate for test purpose or production? Why don't you use the certificate from Certificate Authority? I am using self-signed certificate for test purpose only right now. I have also contacted my IT administrator to provide CA certificate, but that might take a while when I hear back from him. I know self-signed certificates are no good ☺, but until I hear back from him, they are only option I have got. I should also thank you for time and effort in helping me out. I will let you know about any progress when I get CA Certificate from my IT guys.